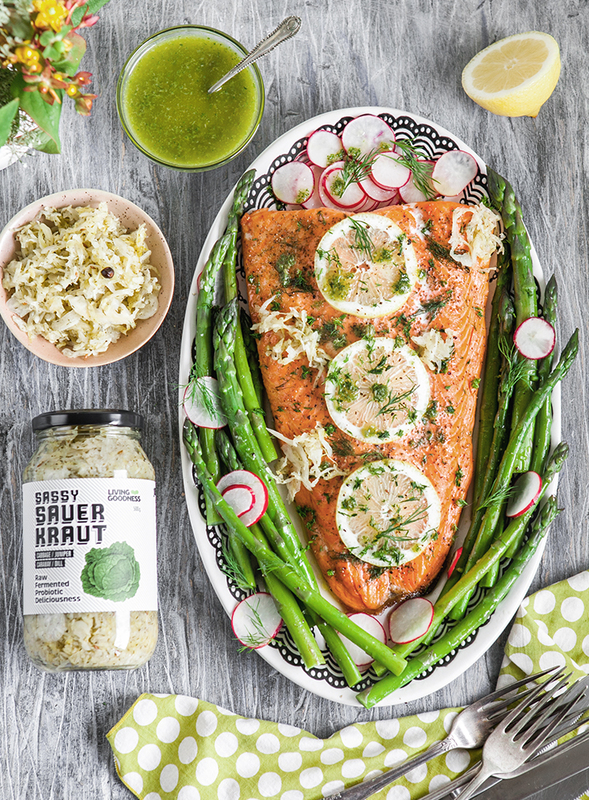 View our Roasted Salmon, Asparagus & Salsa Verde featuring Living Goodness Sassy Sauerkraut. A fancy, yet fast and easy to make, main dish of roasted salmon fillet with Sassy Sauerkraut & salsa verde. A great way to get Omega-3 fatty acids into your diet. • Season the asparagus with salt and black pepper. Drizzle with oil and toss gently. • Flip the salmon over skin side up, firmly hold the sides of the filet and curl it upward by pressing the sides slightly in and carefully score the skin across by slicing through the skin about 1/2 cm deep. • Lay salmon on lined with baking paper tray, brush with oil and season with salt, pepper and fennel seeds on both sides to taste. Slip lemon slices underneath the salmon. Sprinkle with dill and cover with a few more lemon slices. • Bake for about 30-40 minutes. Add asparagus spears. Switch oven to broil and cook another 5 minutes. • Transfer the fish to the platter, add asparagus, drizzle with salsa verde and garnish with dill. Serve with Sassy Sauerkraut, lemon wedges, radish and extra salsa verde. • Combine all ingredients in the blender or food processor and mix well. Season with salt and pepper. Serve in the small bowl. • Serve with Sassy Sauerkraut, finely sliced spring radish seasoned with olive oil and sea salt, fresh dill and lemon wedges.